The internet has obviously revolutionised communications between people but it throws up new connections and opportunities that I think few would have seen coming. A couple of years ago, Dan Chure put up a photo on Facebook of a small sauropod femur with some very obvious theropod bites on it. This was from the Dinosaur National Monument site where Dan worked (he’s now retired) which made it unusual since non-tyrannosaur faunas tend to have far fewer bites in them than do those where the tyrants are present. At first glance though, this looked like a tyrannosaur-type bite with a long set of bite-and-drag marks where the cortex had been really ripped through so this was really unusual. With my extensive background of research on theropod bites, this was something I was very interested in and I didn’t recognise it. I’d assumed something this unusual and interesting would have been described before but not only had it not been (as far as I know it’s not in the literature at all) but no one was even planning to work on it. So Dan and I got to work on this and inevitably ran into some issues. Identifying what is effectively an isolated and damaged femur from a young animal is tricky. 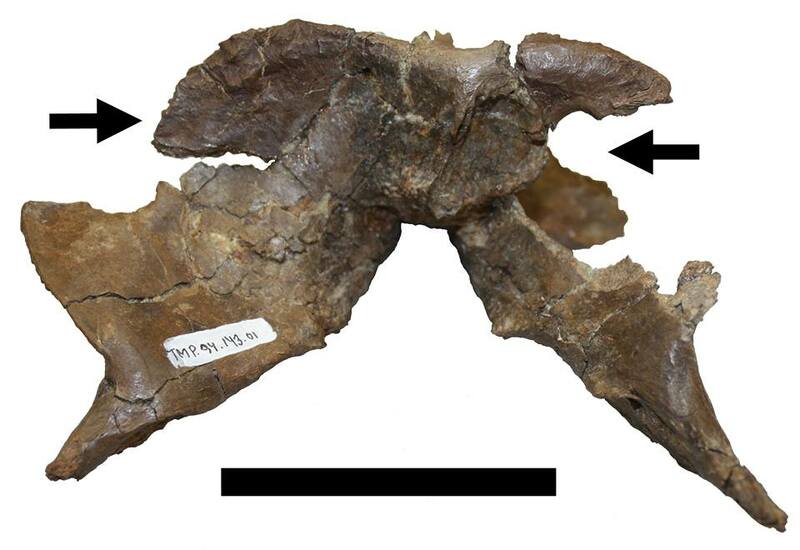 There are a lot of sauropods knocking around in the Morisson and femora are not one of the more diagnostic elements, but we were able to show that it was from a diplodocoid. The femur s under 60 cm long and while that’s obviously a sizeable animal, it is really small for a sauropod and means this was likely a pretty young individual. The marks on the bone are concentrated on the dorsolateral side of the bone and consist of a series of grooves across the face of the bone that are especially deep at the upper end. At their deepest, these go through the cortex and indeed a fair bit of bone seems to have basically been snapped off, perhaps coming apart as a result of the amount of damage to the element. This could also have happened at least in part through transport too. Taphonomically the bone has an odd history, apparently isolated, it is actually very close to a second and near identical femur which suggests that both were from a single animal, but there are not other obvious comparable bones nearby and this suggests a very disarticualted carcass. 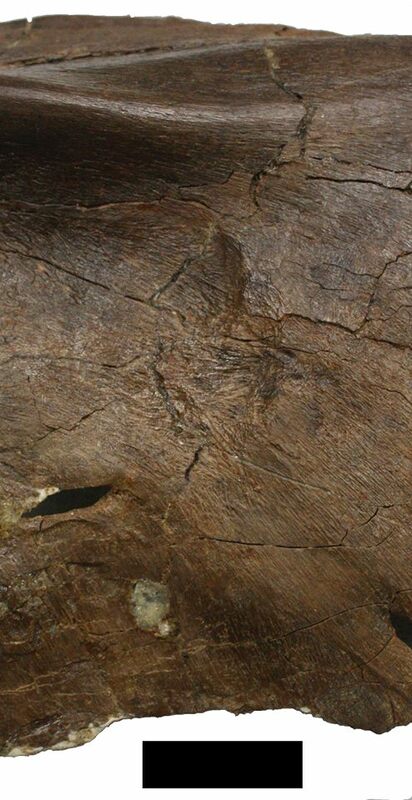 Not only does the other femur lack any bite traces but these are essentially absent in the quarry as a whole. Of the huge number of bones present, only this small saurpod has any bites on it. 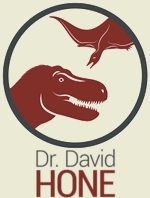 That’s obviously really rather odd – if loads of carcasses were around, you might expect either tons of bites from theropods getting stuck into the wealth of food or almost none because feeding carnivores avoided biting bones when there was lost of muscle, or they simply couldn’t get to the bodies (if they were say underwater). But one bone badly bitten when even it’s companion wasn’t and then nothing else, is clearly an oddity. It suggests some odd circumstance where this one bone was, perhaps temporarily, accessible to a feeding theropod though the exact details of what may have happened are irrelevant, it does add a level of intrigue to this case. The bites themselves are reminiscent of those made by tyrannosaurs – long and deep scores made by a bird-like pull back of the head. That action was common among larger theropods but the specialised premaxillary teeth of tyrannosaurs made them well suited to doing this when the teeth were in contact with the bone. Non-tyrannosaurs did not have the inclination to do this when feeding as with their thinner teeth, these would be at risk of breaking. Other fossils show they had the power to bite deep into bones but generally didn’t, rather than couldn’t, making this case a rare example of this behaviour. While it may have been an exception, it does at least show the capacity of non-tyrannosaurs to feed in this way. Exactly which theropod this may have been though is a still harder question to answer. 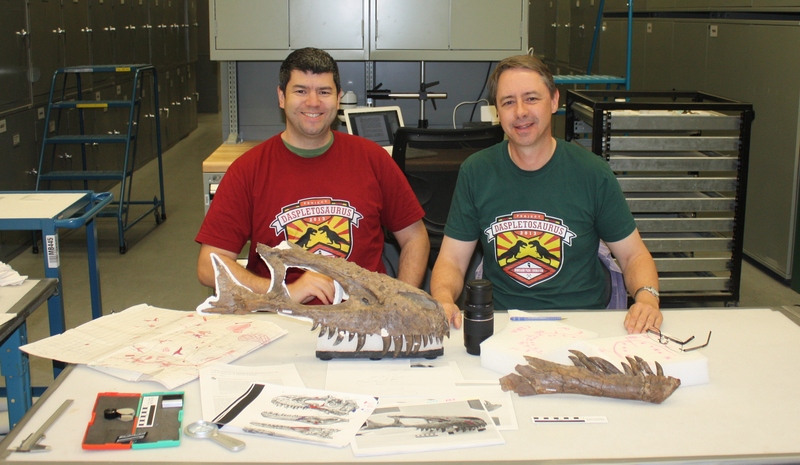 One of the nice things about bites left by large tyrannosaurs is that they are the only credible candidates for the trace maker in a given environment and you are generally only picking between a couple of pretty closely related species. You may struggle to say if a bite was from Albertosaurus or Daspletosaurus say, but it was still a large tyrannosaur with fundamentally simialr anatomical specialisations and behaviours and therefore general interpretations are going to be pretty solid either way. In the Morrison though you have large allosaurs and ceratosaurs and some unstable / uncertain taxonomy too (like Saurophaganax) meaning the options are much more open. Various researchers (inlcuding me) have commented on the possibilities of using the spaces between teeth as an indicator of which animal might have left a given mark. However, as Dan and I cover here while in theory that could be useful, in practice we can’t account for the variables of things like ontogeny and missing or offset teeth and the angle at which an animal might drag the head could all dramatically affect the spacing between traces left by the teeth. In short, where there are mutliple credible trace makers it it going to be very hard to pick between them without soemthing diagnostic like shed teeth. Still, wit no large tyrannosaurs around in the Morrison, whatever did this was not one so we can at least say confidently that at least one large theropod was engaging in tyrannosaur-style feeding, even if it was rare. Perhaps of course the style of feeding was common but merely tooth-bone contact was limited and this fits with waht we do know about that pull feeding action. Even so, this is something of a frustrating project between the quirky history of the bone and its bites and the uncertain identities of the bone and the trace maker. Hopefully more traces like this will turn up or be described from Jurassic beds and we may begin to piece together the feeding styles of large theropods. This one might be a partial mystery for now, but it hopefully provides some useful data fitting into what we know about the behaviour of some of the big theropods other than tyrannosaurs, even if this leads to the idea that they may have been more simialr to each other in this regards than we previously realised. 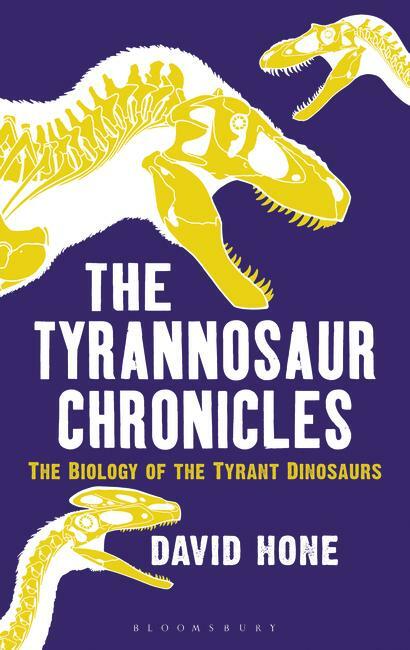 The Tyrannosaur Chronicles actually exists! So the official publication date is drawing near (21st of April) of my first book and I actually have a physical copy in my hands! Oooh! It’s got nice pictures and photos and words and everything! Obviously I’m very pleased but I am also rather nervous about the whole thing – people will be paying actual real money and I really don’t want to let them down. I know you can’t please everyone and even the greatest books will not appeal to every person that picks up and reads even a few pages but despite the years of blogging and outreach stuff this is a new style and form and it’s rather more global in spread than even online media. So, lots of nerves my end. However, anyone who does buy it and hurls it across the room a few hours later in frustration may at least be mollified by having paid 30% below the cover price thanks to a discount being offered by the publishers. 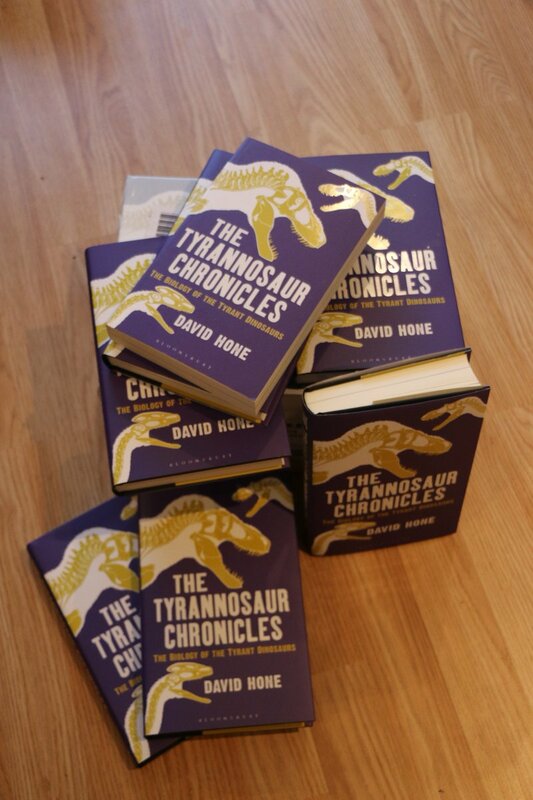 If you order direct from the publishers Bloomsbury before May 31st and enter the promo code ‘DINOSAUR’ at the checkout, it should be reduced. (This has only just been set-up, so do leave a comment if this doesn’t work, or indeed if it does to let me know it’s working!). Finally, if you are in and around London there is a small formal book launch on the 22nd of April. Tickets are free (but you need to reserve them here in advance). It won’t be long or special, I’ll talk about the book for a bit, answer some questions and sign any copies going (available for sale there, and also at a hefty discount). Hope to see some regulars there and I do hope you enjoy the book.